Frito LOVE and (an ironic) new PAGE! 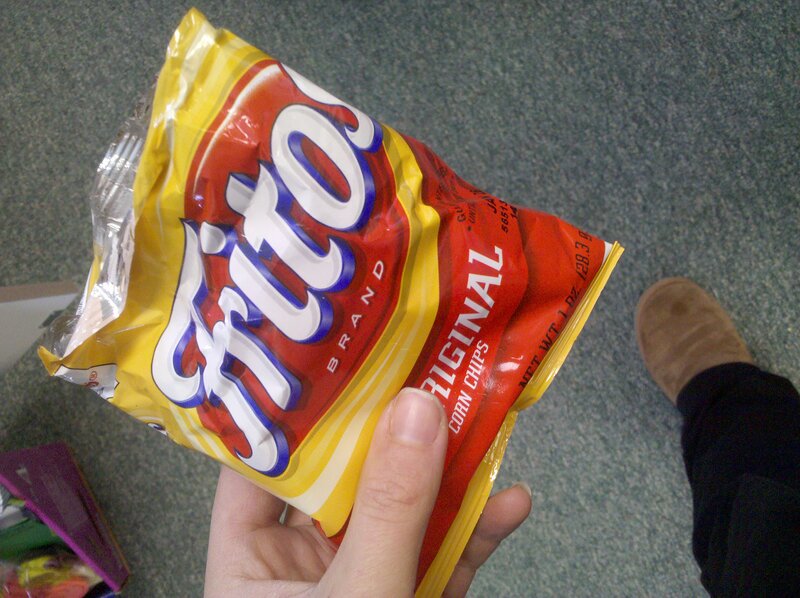 Oh Frito Lay, how I love thee! YUMYUM! Anyway, I will be starting a new page under the heading “Work It” I know, I know, chiche is my middle name!?!? It will be chronicalling my workouts as I hope to run my FIRST race with Blogger Lindsay in the Spring- Linds are you reading this?!?!?! heehee- Anyway, look for my new page later today! Have a WONDERFUL and blessed day! PS: Someone I used to know wanted to “jab it to me today” by insulting me with “you’re ugly.” Seriously!?!? LOL. I know! Good one. Just wanted to pass that on to ya! Did I read that right? Someone called you ugly? Whatttt??? yes, marina, ugly. hahahhah and she used to be my bestie! lol oy. marina by the way-saw that redic bag you got LOVE it. Im jealous- you must have been a good girl this year! What a donkey! Anyways, I am totally reading this and what month do you want to run in??? You tell me and I’m all over it. P.S. You are going to be WAY too fast for me. I love that you read this 😉 i dunno what month. lets do a 10 or 5 k? what do you think? I love how you think im fast- im not. Your beautiful and dont let anyone tell you otherwise lady. People are classless animals.